This year, Gibson is celelbrating innovation and the centenial of Les Paul with an improved series featuring the creator of so many items musical. I sat down with Aljon Go at the International CES 2015 to find out more about these great guitars. The new series of Les Paul 2015 models – including the Les Paul Junior Single Cut, Double Cutaway, Les Paul Plus, Les Paul Classic and many more – are all hand crafted and will contain features that every guitar player should use – from beginner to advanced. The Min etune is Gibson’s self-tuning system. We go over how the Min etune works and how you can get it. This is also an after market item so you can retro-fit your older guitars with this great self-tuning system. Get yourself one of my favorite Les Paul models on Amazon. Each guitar is going to feature the Les Paul 100 signature right on the head stock. On the back will be a holographic photo of Les Paul and the last time he was on stage. The frets are 27% shorter so you can play the upper neck easier. A detactable pick guard allows you to change out guards with a snap. You can also put the pick guard away in a safer part of your case when travelling. Finally, Gibson has changed to the Zero fret adjustable nut – a brass nut that gives you option to change the height. Bring the action down for a fingered-fret sound or turn it up so you can play slide without issue. Other great options like a wider fretboard, mother of pearl inlays and an improved contact output jack allow for the serious musician to put out the best sound possible. 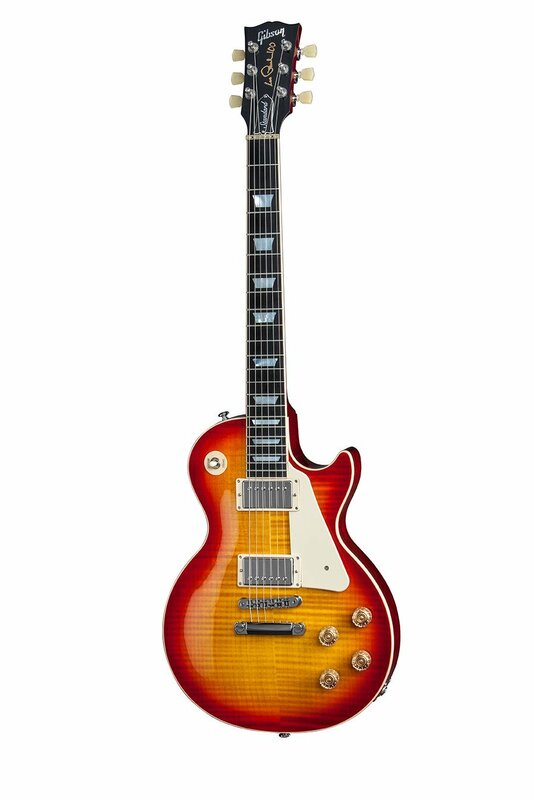 The 2015 guitar line starts at $899 For more information, check out Gibson.com.